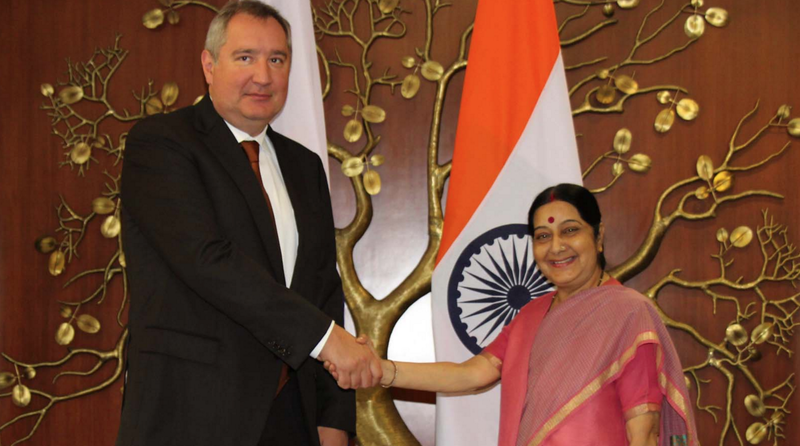 Sushma Swaraj, India’s External Affairs Minister, and Dmitry Rogozin, Russia’s Deputy Prime Minister. Sushma Swaraj, India’s External Affairs Minister, and Dmitry Rogozin, Russian Deputy Prime Minister, met Tuesday in a day-long session of the India-Russia Inter-Governmental Commission on Trade, Economic, Scientific, Technical and Cultural Cooperation to carry the bilateral agenda of collaboration forward and finalise “concrete outcomes”. There were a series of outcomes that emerged from the IRIGC meeting, including the launch of an industry – level Working Group to fuel energy cooperation, and collaboration in pharmaceuticals under the Russian “Pharma 2020” programme and an impetus on enhanced connectivity. Co-chaired by Sushma Swaraj, India’s External Affairs Minister, and Dmitry Rogozin, Russia’s Deputy Prime Minister, the 22nd Session of the IRIGC reviewed the preparations for the forthcoming India-Russia Annual Summit to be held in Goa on 15 October 2016, and set the course for future areas of bilateral cooperation. At the meeting, India and Russia “launched an industry level Working Group- led by Gazprom, biggest Russian gas company, and a consortium of Indian oil and gas companies- for creating an ‘energy bridge’ between the two countries through possible gas pipelines for direct gas delivery from Russia to India,” the MEA release of September 13 stated, claiming there had been substantial progress with expanding cooperation in oil & gas sphere. Indian and Russian oil & gas companies are working towards finalisation of investments in each other’s countries. Recalling the recent dedication of Unit 1 of the Kudankulam nuclear power project by Prime Minister Narendra Modi and President Vladimir Putin, the MEA spokesman said, “Both sides renewed their commitment to work together on remaining stages of Kudankulam 2,3,4,5 and 6; and other projects through localisation under the ‘Make in India’ programme,” which Russia fully supports..
Connectivity was a major theme of discussion during the meeting of the Commission. Implementation of the International North South Transport Corridor (INSTC) project and the launch of the ‘Green Corridor’ project for customs facilitation are major steps towards better connectivity and trade facilitation. Cooperation between Indian and Russian railways in the field of dedicated freight corridor, modernisation of railway stations, and training of railway personnel emerged as a new area to broaden cooperation in transports & logistics. To raise bilateral trade, pharmaceuticals are an area where the countries have focused. “Indian companies are closely engaged with Russian partners to develop cooperation under the Russian ‘Pharma 2020 programme’. On the sidelines of the Commission’s meeting, an Indian company Wockhardt and a Russian company PharmEco have signed an agreement for joint project for insulin production in Russia under the Pharma 2020 programme,” the MEA spokesman said. There has been 20% increase in the number of Indian students studying in Russia, while there has been 14% increase in Russian tourist visiting India in recent months. Student and faculty exchange, cultural cooperation and tourism have emerged as new areas for bilateral cooperation. India and Russia will be celebrating the 70th Anniversary of establishment of diplomatic relations between India and the erstwhile USSR (now Russian Federation) in 2017. A series of activities are being planned to celebrate this important milestone. There will be a new emphasis on promoting cooperation among various states in India and federal regions in Russia, especially the Far East region of Russia- as attractive investment destinations. Asserting that India and Russia share a special and privileged strategic partnership, the MEA said the delegations were “satisfied” with the status of the relationship and the work being done by the various working groups and subgroups under the IRIGC-TEC mechanism, ahead of the bilateral summit next month. President Putin will travel to Goa in India in October for the BRICS Summit, and will also hold the annual India-Russia bilateral Summit with Prime Minister Modi. The bilateral strategic partnership was elevated to the level of a 'special and privileged strategic partnership' during the visit of President Putin to India in December 2010.